Vashikaran by Cloth or Kapde Se Vashikaran is another one of the popular Vashikaran Totka according to the Vashikaran Tantra. Many readers of this site have written to me requesting me to publish an article on putting a Voodoo Spell of enchantment using the clothes of the desired lover, husband, wife or a family member. 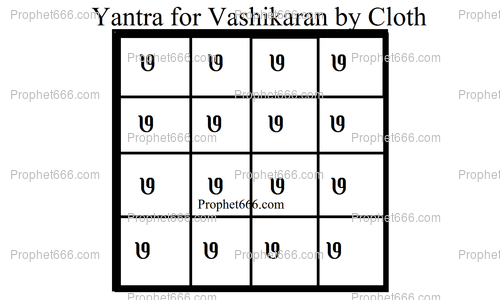 Even though, I have not come across anyone who has tried and tested this Vashikaran Yantra, I am still publishing it in this post. The Yantra is a simple one, as you will have noticed, the number 7 is written in all the squares. It has to be drawn on a piece of cloth belonging to the sought after beloved, even a handkerchief will suffice for performing this Tantra. The Vashikaran Yantra must be written on the piece of cloth belonging to the desired bellowed, with the Paste of Gorochana using a pointed twig of the Anar [pomegranate tree]. Then this piece of cloth should be worshipped by offering it Dhoop/Diya/Scented Flowers. Then the practitioner should hold the piece of cloth, with the Vashikaran Yantra drawn on it, place it against his or her heart, concentrate upon a mental image of the desired man or woman lover for 4-5 minutes, and then keep the piece of cloth in his cupboard. The Vashikaran Tantra can be performed on any day and time. No, the Vashikaran Yantra has to be used and kept as I have described in the above article. I am doing it, then I should keep it in my cupboard or her's ? For how many days you have to do? If unable to concentrate properly while performing the experiment, you can repeat it, till you get it right. but sir i don't understand the mantra exactly. Can someone share if something worked ?